Tomatoes are back in season – hurrah! I stay clear of imported fresh tomatoes during the winter months for obvious reasons but the long wait for the British season is rewarded with incomparable sweetness and flavour. This recipe is based on an Ottolenghi recipe that has the fun title of ‘tomato party’. Here, I use a mix of different types of raw tomatoes with oven dried tomatoes,but feel free to roast some too as per the original recipe, to give even more of a combination of flavours and textures. On this particular day, I wanted the freshness of the raw tomatoes to be the focus and I already had some oven dried tomatoes left over from the puy lentil, tomato and goats cheese salad so it was very quick to assemble. Couscous is made from semolina wheat with the most common being the tiny pin-head variety, and is a staple in North African dishes. Israeli couscous is a medium size ‘pearl’ couscous that is which is made from hard wheat flour and roasted. Then there is the largest of all, Moghrabieh, the Lebanese giant couscous that is used like pasta. All are incredibly versatile to cook with and can be used in salads, stews, soups and served with all manner of dishes. I have also used barley couscous as a variation which is not made from wheat and as has a nutty flavour and a more grainy texture. You can buy the giant couscous in Middle Eastern grocers and the barley couscous from larger supermarkets. If you can’t find the different varieties then just use double the quantity with normal couscous. Pre-heat oven to 110C/gas 0.25 / 225F. Cut half of the tomatoes in half and place face up on a non-stick baking tray. Sprinkle with fresh thyme leaves, salt and pepper and bake for 1 hour 30 minutes. Set aside. Put barley couscous in a bowl with a pinch of salt, a drizzle of oil and pour over boiling water – enough to just cover. Stir, cover with clingfilm and set aside for 10 minutes. Fluff the grains with a fork and leave to cool. Add the giant couscous to a pan of boiling salted water and simmer for 18-20 minutes, or until al dente. Drain and rinse under cold water then leave to dry completely. 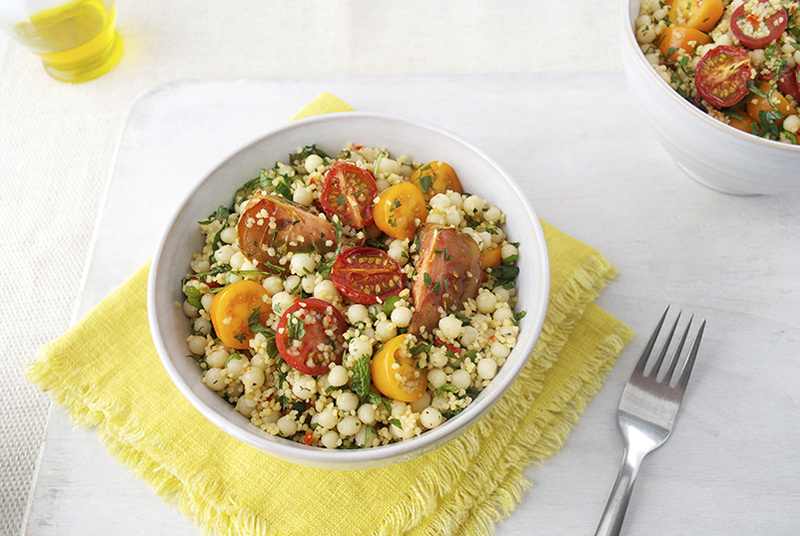 Mix both types of couscous in a large bowl with the chopped herbs, crushed garlic and tomatoes. Add a squeeze of lemon, drizzle of olive oil and adjust seasoning to taste. This entry was posted in Recently cooked and tagged couscous salad, fregola, giant couscous, mograbieh, tomato salad, tomatoes on 22/08/2012 by Val McArthur.